The 2016 parliamentary candidate of the New Patriotic Party (NPP) in the Kumbungu constituency, Iddrisu Muktaru popularly known as DEMS has died in an accident. 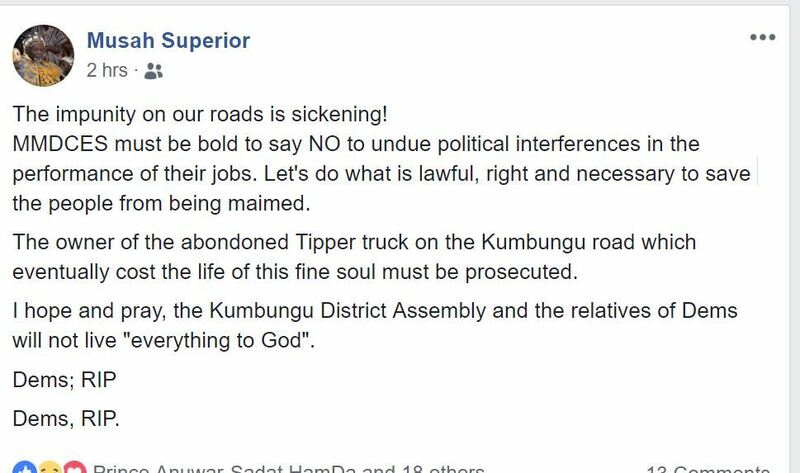 Tamale Metropolitan Chief Executive (MCE) Iddrisu Musah Superior in a post over the increasing causalities as a result of the recklessness of these tipper trucks said “The impunity on our roads is sickening! MMDCES must be bold to say NO to undue political interferences in the performance on thier jobs. Let’s do what is lawful, right and necessary to save the people from being maimed.